1845. Frederick Douglass, a black American slave, lands in Ireland to champion ideas of democracy and freedom, only to find a famine unfurling at his feet. On his travels, he inspires a young maid to go to New York to embrace a free world, but the land does not always fulfil its promises for her. From the violent battlefields of the Civil War to the ice lakes of northern Missouri, it is her youngest daughter Emily who eventually finds her way back to Ireland. 1919. Emily Ehrlich watches as two young airmen, Alcock and Brown, emerge from the carnage of the First World War to pilot the very first non-stop transatlantic flight from Newfoundland to the west of Ireland. Among the letters being carried on the aircraft is one which will not be opened for almost a hundred years. 1998. Senator George Mitchell criss-crosses the ocean in search of an elusive Irish peace. How many more bereaved mothers and grandmothers must he meet before an agreement can be reached? 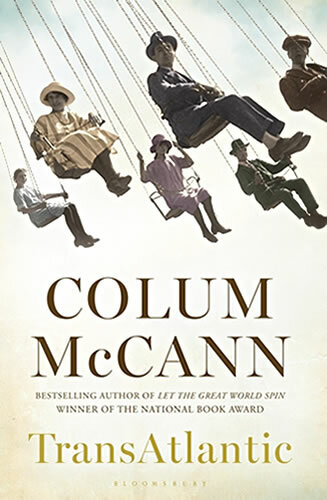 Elegantly stitching these stories together, National Book Award-winning author Colum McCann explore the fine line between what is real and what is imagined, between fiction and non-fiction, between promise and memory. Can we pass from the new world to the old? How does the past shape the future? How does even the most unassuming moment of grace have a ripple effect on our lives? Intricately crafted, poetic and deeply affecting, TransAtlantic is an outstanding act of literary bravura. Book features : Brown boards with gold-coloured text on spine, pale blue decorative head and tail bands, and turquoise endpapers. TransAtlantic is one of the thirteen novels longlisted for the 2013 Man Booker Prize. For more information, you might like to visit Colum McCann’s website. This is a rich source of info on his life, books and future projects.